Proof Copy of B33, soft back. This is a signed copy of the 1953 ‘Collected Poems’ of Anna Gordon Keown, Keynes B26. This First Edition was limited to 380 copies, 20 bound in full morocco and signed by the author and 360 bound in buckram. Siegfried Sassoon wrote the Foreword. Anna Gordon Keown was the wife of Philip Gosse, the son of writer and one time Chief Librarian at the House of Lords Library, Sir Edmund Gosse, who was a close friend of Sassoon’s Uncle, Hamo Thornycroft. Sir Edmund’s wife, Ellen, was also a great friend of Sassoon’s mother, Theresa. This copy is number 92 and although not one of the 20 signed copies, this one bears the author’s signature in an inscription (see right). Piers Prodigal By Ian Davie, left, (Keynes B33), published in 1961 by the Harvill Press. Centre, Title page with author’s signature. Right, Proof Copy. 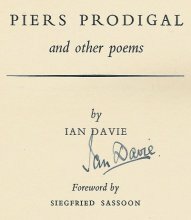 Although he did not know him personally, Ian Davie sent Siegfried Sassoon these poems on 1st May, 1960, asking him for criticism. Sassoon loved the poems so much he asked Davie to come and visit him at his home, Heytesbury House. Sassoon then agreed to write the Foreword to the book. It was Ian Davie’s first book of poems to be published and the subjects ranged from philosophical, spiritual, nature and love.